Yesterday, I showed you a gorgeous yellow polish from the new OPI Brazil collection and today I have the other polish I picked up from that collection. I only got 2 polishes, because the rest of them just didn't seem that interesting. But I have to admit, Live.Love.Carnaval is looking better and better... Do any of you own that and is it worth getting? This polish however, I didn't need to think about, I knew I wanted it as soon as I saw the first swatches. 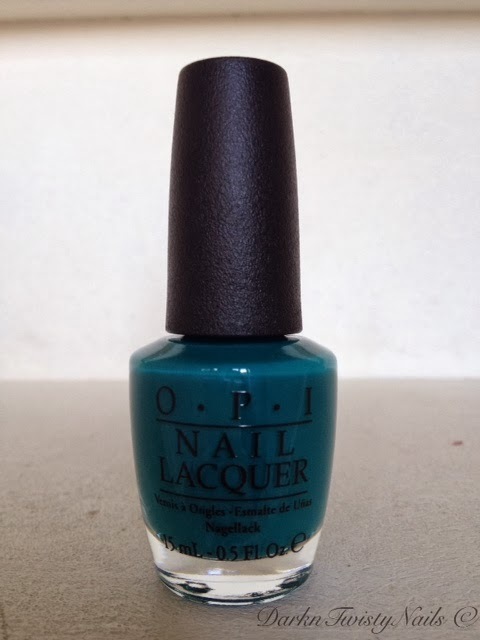 OPI AmazON... AmazOFF is a teal cream that leans more to the green side of teal. The formula is really nice, it is a cream, but almost looks like a crelly. It flows on the nail with ease, is opaque in 2 coats and dries really fast and super shiny. My swatches are without topcoat to show off the shine. I absolutely love it! I've been on the hunt for a great teal cream for a while, but I just couldn't decide which one I wanted, so this polish came at the right moment for me. It's simple, but stunning and makes a nice colorfull statement on your nails. If you love teal polishes, you need to get this! What's your favorite of the OPI Brazil collection? Wow, I saw swatches of this and I thought it looked frosty...it's a beautiful creme, strange. Looks great on you Anca! I did read some reviews that stated this is a shimmer, but I looked very closely at my bottle and there is definitely no shimmer in it. I like it better as a straight up cream. Beautiful! Did this stain...I want it but read it stains really badly. I have and love live love carnival! Ibhad to go to nubbins and put it on to cheer them up. My picture was awful so I didnt post it. But its so bright and happy. Great coral!! Jup, it did stain my nails, but that should be fixed with 2 coats of base coat. This beauty is just to nice not to wear.